The Nestle Boost PLUS Rich Chocolate 8oz Tetra Brik Case of 27, Model #4390093238, is anchored in advanced science and research. Nestle Healthcare Nutrition offers nutritional solutions for people with specific dietary needs related to illness, disease states or the special challenges of different life stages. The Nestle Boost PLUS Rich Chocolate 8oz Tetra Brik Case of 27 features 360 calories and 25 vitamins & minerals per serving. 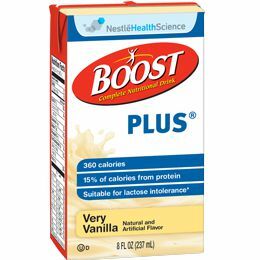 Boost Plus contains CalciLock blend of essential nutrients to help support bone health and contains Prebio1 a blend of prebiotic fibers designed to help promote the growth of beneficial intestinal bacteria and support a health digestive system. Increased protein and energy needs.